As we looked at yesterday, the Coppock Curve is extended to levels approaching past highs. Even a slight decrease in equity indexes could turn the indicator lower, suggesting that the cyclical bull market’s best times are over. It is useful to step back from the daily volatility of the market and gain an overarching perspective. We are currently smack dab in the middle of a secular bear market cycle which will probably end somewhere around 2017. Under a best case scenario, it will take at least until then for the ramifications of the current crisis to work themselves through. So it is foolhardy to expect to see a secular bull market before then in stock prices. In the mean time we can see powerful bull markets in other assets and even powerful short rallies in stock prices, as we’ve seen since March 2009. For the past few years, the Japanese secular bear market has provided an uncanny blueprint for the S&P 500 index. While separated by geography, culture and time, the two markets bear a striking resemblance. Of course, the two don’t match each other step by step. For example, if we follow the Nikkei’s exact footsteps we should have seen the rally continue unabated until June 10th 2010. The general pattern of important lows and important highs has matched up surprisingly well. In fact, if it continues to do so, then we are about to see a significant decline into the final months of this year. As Lawrence G. McMillan writes in the recent article, history paints a bleak picture. In the short term I couldn’t help but react as I have in the past to the readings of capitulation (Calling All Contrarian Investors!). I’m still waiting to be proven wrong. Just today the energy sector got nuked as a result of an impending government investigation into BP’s Gulf oil spill. That helped erased all the gains from last Thursday and put the S&P 500 once again in an area of congestion (and support). That’s all for the short term however. In the medium to long term, it is important to remember that the aftermath of secular bear markets is grueling, long and painful. A little off topic: Congratulations for your news section, it is an excellent summary of relevant information and analysis. 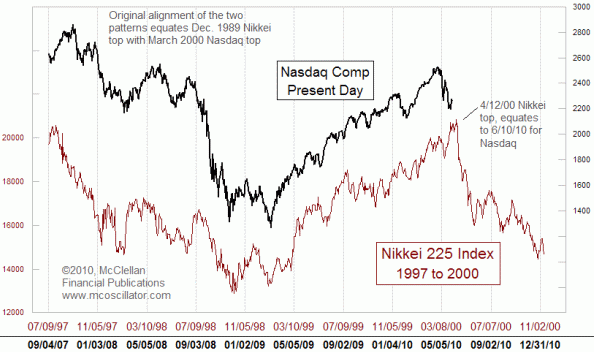 Nasdaq is not Nikkei, other than a coincidental correlation there are many differences, more difference than similarities i would add.. so a conclusion of a long bear till 2017 may well turn out to be false. The market certainly seems bearish for now, but allot can change in 6 months, interestingly Gold is holding up? How about the 1966-1982 Secular Bear Market? 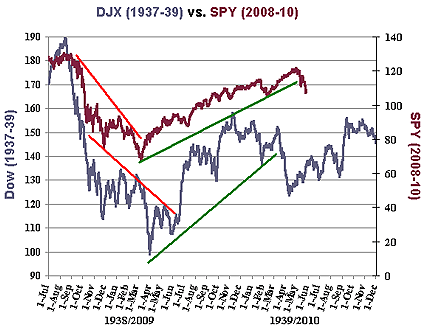 Using that “playbook”, SPY 2010 = 1976 (10 years after 2000 = 1966 Peak), and can still rally until June 2011 (corresponding to 1977). Modeling the magnitude of decline and subsequent rebound (using Fib retracement levels), it’s possible for SPY to peak in Q2 2011 at around $125-$130. 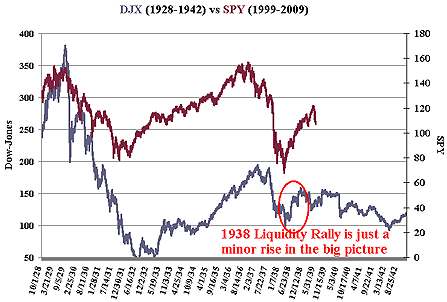 Maybe useful to show the charts here so readers can decide which Secular Bear Market most resembles today’s market. Wimpy, the market compares remarkably well with the 1965-1982 bear market. I’ll see if I can write something up with a chart to show you. You can also look at this from a valuation perspective and get a similar result, as Vitaliy Katsenelson and John Hussman have noted. Secular bear markets end (and secular bull markets begin) when stocks are at extremely low valuations. For example, by the secular bear market that started in the Great Depression finally ended, stocks were trading at about 7x trailing earnings on average. It takes years for valuations to grind down that low, as investors gradually give up on stocks. Given that sentiment drives the markets it makes perfect sense for historical patterns of crashes and bull markets alike to have similar stages of fear of and greed, but the flip side is of course - the heisenberg uncertainty principle, or the “observer effect” - if everyone is looking at the same analysis, the sentiment is going to get skewed and history may not repeat itself. We’re 10 years into a secular bear market and essays/blog posts such as this one acknowledging that are still few and far between. Which is unsurprising. The retail asset management industry is predominantly long-only and un-hedged on the equity side (a strategy I’ve likened to picking up pennies in front of a steam roller during a secular bear market), so fund managers quoted in the financial media are typically counseling retail investors to buy & hold, buy more on dips, etc. Acknowledging that we’re in a secular bear market would be bad for business for them.